Bookkeeping for your small business is imperative-especially if you don’t want Uncle Sam chasing you down. I know as a creative, the money part gets hazy and you’d rather focus on creating–heck, we all do. Your money matters and managing it well pays off. Bookkeeping for your small business and having a better understanding of your money flow should be just as important as being creative. One thing to note: you need to do what works for you and your creative small business. There are millions of books, websites and seminars, take what you need from them and leave the rest. Something amazing you can do for your small business is to sign up for a bookkeeping software program. I personally use Outright Online Bookkeeping because it was simple to understand and the dashboard doesn’t overwhelm me. Actually, Go Daddy bought their company out last year and their known now as Go Daddy Bookkeeping, but I prefer calling them Outright. Here is a guide: step-by-step of how to set up an account, plus how to use it for your business. Outright has two price points– free and the $9.95 price point. For you, they break down the difference between the two. Throughout the year and at the end of the year, they offer discounts for one year, so make sure you follow them on twitter to learn about the deals they might be running. After you’ve decided which program you want to use for your business, the sign up part only takes a couple of minutes. Next, Outright will ask that you link your accounts, that’s how they do all the magic. They just integrated Stripe as a Payment Gateway and they are looking for people to beta test Authorize.net and Dwolla if you are interested. You can see all your account information on the side bar on the site, the system automatically updates this information for you. I tried using another company and it was beyond a headache. The system never updated my bank account information or it wouldn’t categorize my expenses and income correctly–literally, it was a nightmare. With the other company, I was doing more work than I was suppose to, not to mention, invoicing was just crappy. They also have the option of sending clients and customers invoices, plus tracking them on your dashboard, especially great if you run a B2B (Business to Business) company. As a business to business company, invoices are essential to my business and it helps me keep track of clients to pay them on time. I also like that it reflects my companies P&L (profit and loss), you can see below that its always displayed at the top of your dashboard. I actually like seeing my company has made X amount of money to date, it brightens my smile–especially knowing my growth from the starting point to where my business is now. Finally, the most important reason to sign up for this particular bookkeeping software is the tax option. Note: the complete tax breakdown is only offered in the $9.95 version. My accountant last year was singing my praises after I showed up with all my information on three pieces of paper, as most businesses show up with boxes of receipts. Wish I could take full credit, but it was just papers printed from Outright, this is a time saver. I have had clients sign up for it too and their accountants are loving them as a result. Make sure you make bookkeeping a priority for your business, not just once every blue moon or during tax time. Put money management on your schedule–one hour a week will help you get a better grip of company cash flow, profit, revenue and much more. Check out missed tax deductions of small businesses and what is sales tax in business. 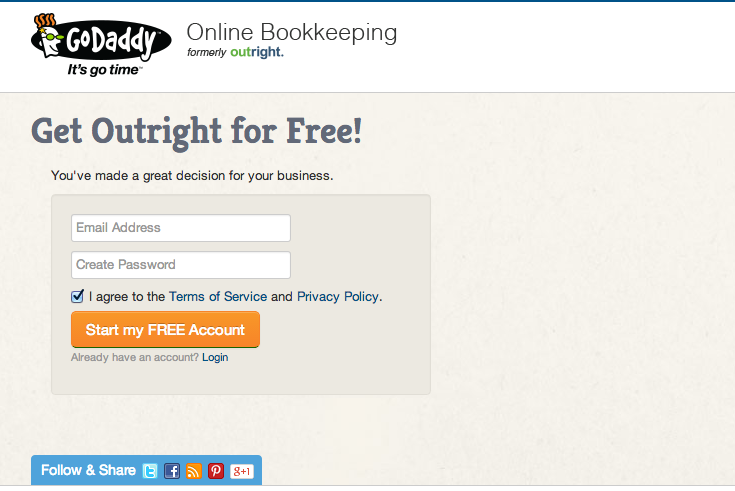 Are you currently using a bookkeeping software for your small business? How has it helped you? Are you overwhelmed by bookkeeping so you shy away from it? Let’s talk about.